Congratulations to Fire Life Safety team members Jarod Myrick and Calvin Karsch on their recent accomplishments. 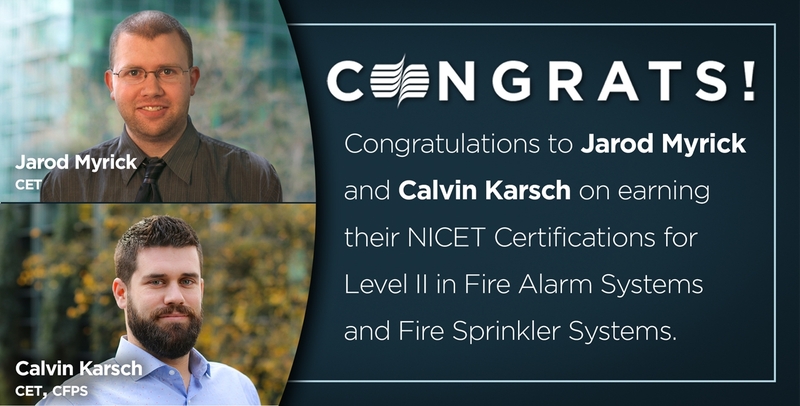 Jarod and Calvin both passed their National Institute for Certification in Engineering Technologies (NICET) Certifications for Level II in Fire Alarm Systems and Fire Sprinkler Systems, respectively. Additionally, Calvin just earned his Certified Fire Protection Specialist credentials. Way to go Jarod and Calvin!